Consort Stainless Steel Finish Heatstream Slimline Electric Plinth Heater available in 2kW or 3kW Models Provides instant heat where space is at a premium and discreet yet effective heating is required. Cleverly concealed in the "kick space" beneath counters, displays and kitchen units, stairwells and fitted furniture, these heaters are suitable for both commercial and domestic environments. They require a minimum kick space height of only 100mm thereby offering increased installation options. 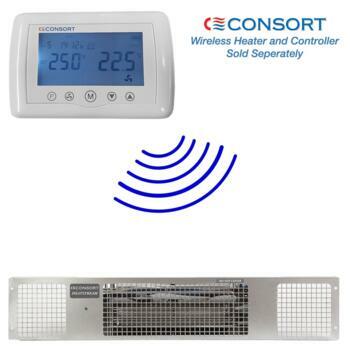 The standard range features a thermostat to switch the unit on and off thermostatically - whilst the wireless controlled models have no switches on the heater (model requires a CRX2 controller, not included).